One of the unexpected benefits of hospitality is having all this nice fruit and greenery afterward. 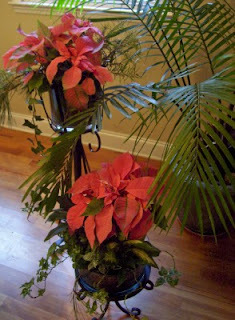 The $2.50 poinsettias found a place next to my dining room palm. I even used the last of my 99-cent wired ribbon. The table runner is a long paisley scarf from Goodwill. 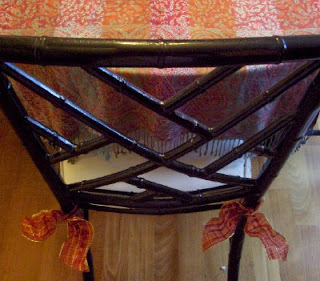 I never quite got the knack of wearing over my shoulder, but its color looks so rich against the black table. I love finding untraditional things to dress up a table, mantle or side bar! I've never thought of a scarf though. That's a great idea.